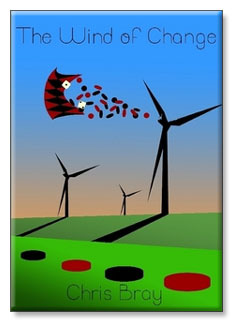 This is the fourth in Chris Bray's series of "Wind" books. All four books are largely anthologies of his writing for The Independent newspaper in the United Kingdom, although there is additional material in all of them. The articles were written between 2010 and 2012. COVER: The game of backgammon continues to evolve and the last twenty years have seen a period of rapid development in the game. This is largely because of the advent of backgammon computer programs Jellyfish, Snowie, and, most recently, eXtreme Gammon. Consequently the modern expert player is light years ahead of his 1990s counterpart. The material in this book covers not only the development of backgammon theory but also looks at the history of the game including some of its more famous and colourful players. For example it is only in the last twelve months that some of the history of the doubling cube, which is at the very heart of backgammon, has been discovered. The timeless characters that make up Chris's menagerie continue to point a vibrant picture of life in the high stakes chouette. Sherlock Holmes and Doctor Watson are also on hand to lend instruction and for this book Jeeves and Wooster have joined the party as well. Chris's articles are targeted at a broad range of players and everyone from the casual player to the expert will improve their game by studying the diverse positions in this book. AUTHOR: Chris Bray is the backgammon columnist for The Independent newspaper in the United Kingdom and has been playing and studying the game for over thirty years. In this anthology of his most recent Independent articles, he traces the further development of many aspects of the game.